White spots and white lines, we’ve all been there, unfortunately. They magically appear on our nails every now and then and we never know why. We just let them be and before you know it, they are gone (well, most of the time). White spots on our nails are common and usually not too serious. The spots and lines happen mostly because of some type of an injury on our nails, or sometimes a whole bunch of injuries (traumas) need to happen before the spot line appears. If you find your spots to be all over the place and you would like to change something about them, you should just go to a regular doctor’s check-up. They will, most likely, tell you that you have Leukonychia, which is a condition that causes the spots to appear. But don’t be scared about it, since it is not dangerous. It is actually very common with men and women and happens to your toenails or fingernails. You could be having the smallest dot on the nails or a whole spectrum across the nails. Either way, you spot the spot, don’t be worried about it, it is harmless and you’ll be fine. The most common cause of Leukonychia is an injury to your nails or your nail bed. If you just damage your nail or your finger white spots could occur. Also, sometimes, getting often pedicures and manicures may damage your nail beds. So better be careful when you are getting them, and you better have a professional who is on it. You may have an allergic reaction to something. You are dealing with a nasty fungal infection. You have injured your nail on something. You are lacking in the mineral department. Hardly and rarely enough, it is possible for you to have an allergy to a nail polish, nail polish remover or even just a regular gloss. Too common use of gels and acrylic nails can also damage your nails and cause them to peel off easily. The most common nail fungus often appears on our toenails. The first sign of the infection is when you see a few small dots on your nails. Later on, the infection will spread on your entire nail bed. 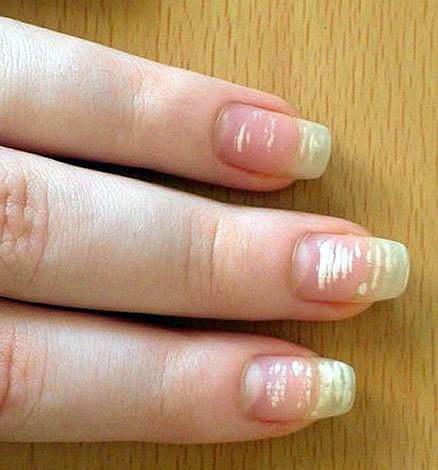 You will notice that your nails are becoming brittle and very thick. Sometimes even a weird odor could occur. If you’ve ever injured your base of the fingernail you may have caused a problem, since the nail will most likely become black and will grow slow and hard. Depending on the type of your skin, your injury might not show for weeks, or could pop right away. Be careful, since you can earn this injury at every corner. We mostly harm ourselves by slamming the door, striking the nails with a hammer or when typing too hard and violently. Also, these damages can happen with a bad and clumsy nail tech. They can apply a hard pressure when doing your nails and buffing them, which will damage your nails. Chances are, if you are not living a healthy lifestyle, that you may be lacking some minerals as well as vitamins in your system. Even lacking zinc and calcium leads to those white spots popping out. These are, luckily, quite rare, but if you believe that the spots weren’t caused by Leukonychia, you might want to explore your other options and visit your doctor. He will do a bunch of tests and ask you loads of questions before jumping into the conclusions. Your spots may have different patterns, so don’t let that freak you out. They can look anywhere from tiny sized dots, larger lines across the nail or larger individual dots. Know that the cause of your spot may tell you how the spot appeared. If you had a normal typical injury you will probably have a large white dot in the middle of the nail. But, if you have an allergic reaction, you will experience several dots all over your nails. White Spots: What’s The Diagnose? If you are not experiencing these spots too often but rather associate them with an injury you had few days ago, then you should not visit your doctor. Just try to be less clumsy and be more calm and careful so you can avoid injuring your nails in future. What Does The Doctor Think? But, if you believe that the spot is being persistent and maybe even getting worse in time, you should visit your doctor. Your doctor will check out your nails on your hands as well as feet. You will get a prescription after they diagnose you. If you have an allergic reaction, you will need to stop using the nail polish or any type of a nail product that has caused your allergy. Antifungal medication is going to be your therapy. You will intake it orally and for about three months you should be cured. If you misbehave and don’t take your drugs the proper way, chances of you recovering will be slimmer. And in case you’ve injured yourself the best cure for that is time. Your nails will grow, and as they do, they will push the injury up to the tip of your nail. That means that in time your white spot will disappear. Now you know what causes white spots on nails, as well as how to treat them. Just make sure that you are properly diagnosed before starting any of the treatments. In a short period of time, you will see the improvements on your nails.